Buy Avalon plum trees online FREE DELIVERY + FREE TREE WARRANTY from UK suppliers of garden fruit trees. First introduced in 1980, Avalon (Prunus domestica 'Avalon') is a nice, large, round-oval, red coloured plum. One of the finest quality dessert plums . A partially self-fertile and strong growing tree with a tendency to lightly cropping in early years. This plum tree is supplied in a 12L container with a Pixy root stock. This means the tree will grow to around 3 metres but can be restricted by growing in a pot or pruning. 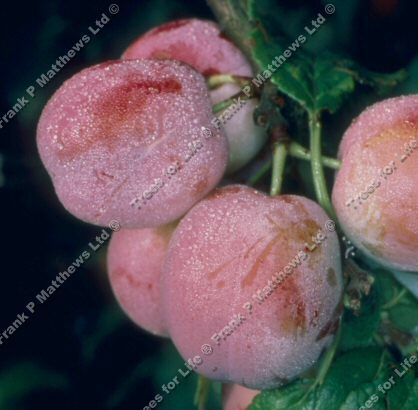 Fertility: This plum is partially self-fertile so in all probability another plum is required for pollination. This means your fruit yield is dependant upon other plum trees in the area. If you are on a housing estate, chances are another plum is close enough. If you live in a lighthouse with your Avalon plum tree growing in a pot indoors, chances are your fruit yield will be low! This plum is in flowering period is C2 so for a for a suitable pollination partner, choose another plum from the flowering periods C1, C2 or C3 (as shown in the product titles). Our Avalon plum tree is supplied in a container, which means that the tree can be planted any time of the year and with better results than either bare-root or rootballed trees.